Case: The ritualistic nature of a crime scene catches Mulder and Scully's attention. A complicated episode that produces complicated feelings in this X-Phile. Scully: "That's my leap of faith forward. And I'd like to do it together." Mulder: "I've always wondered how this was gonna end." We have all been wondering that. Things have even ended, so to speak, at the close of Season 9, yet here we are. At long last, though, is a conversation between Mulder and Scully that is so full of the emotion and language I have longed for that it compelled me to hold my breath when I watched it. 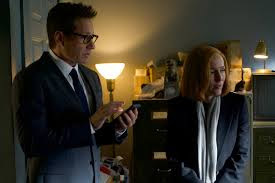 I have to say that final scene between the two would really have been nothing without Duchovny calling forth all of the authentic tender seriousness age has brought him. He elevated that character more in four minutes than in several seasons past. But it wasn't just the final scene that leaves an imprint. There has been an indescribable sweetness between the two all season that has crescendoed into this defining moment for their future and 'Nothing Lasts Forever' built their interactions like a painter adding the final touches to an oil on canvas masterpiece. Those last strokes being practically undetectable, yet so nuanced they take the work from expensive to priceless. Those belong to Anderson. It's through her eyes we so often view Mulder, so by her letting us see Scully through his, it was as if we finally went from black and white to technicolor in our understanding of them. I didn't want to write this review. I didn't not want to write this review. By all accounts, this is my last review of a series that changed my view of the world in great, funny, strange and giant ways. I've also never had such depth of emotion surrounding a fandom as this (some have come close but none compare in duration). Publishing this has felt so final this week, I've hated to push the button. I've taken into account at such a deep level of my molecular structure what this relationship says about humanity, our psyches, me – watching these two through the years has given me countless hours, days, maybe months of contemplation of what connecting to another person is about. So, seeing it come to this, is very meaningful. I know there are many who have enjoyed this show wholeheartedly in the decades since it first invaded our televisions with nary an interest in the Mulder and Scully saga. So, this paragraph is for you. To have the pinnacle of this relationship juxtaposed with the revelation of a cult of once-discarded-from-society devotees to two courageous individuals determined to stay relevant, rejuvenated and alive by putting organs and blood in a blender and passing it around for nourishment in a dingy apartment that hasn't seen the light of day in god knows how long while occasionally medically attaching themselves to one of their followers for periods of time must not have disappointed. Add to that, a garish rendition of 'The Morning After' while someone commits hara-kiri across the room, a huntress who's called 'La Avispa' (the wasp) and kills with wrought iron spikes from her church's fence while quoting scripture and visuals of two people stitched together into a skin accordion, and everyone here is happy, right? Brava, to 'Nothing Lasts Forever' (Karen Nielsen is the writer) because the 45 minutes that make up this gem gives us the paradox of the wistful bittersweet heart-wrenchingly impermanence of human existence and a beautiful end to two characters who will endure. * Mulder really knows how to clear a room. * When you hear the phrase 'the dark web' on The X-Files, it sounds like it was invented for the show. * YOU GUYS SCULLY GOT A PUPPY FROM PRAYING AND THEN COMMITTED TO CATHOLICISM. * The A story = American Horror Story meets The Human Centipede. 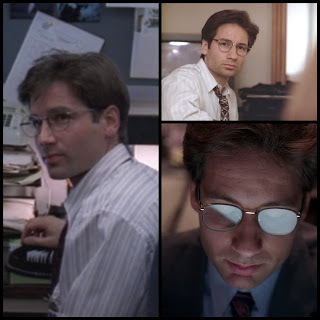 * Mulder in the church the first time was like his tight five. * Okay, that is not the Bronx. * [Also] Okay, that church is not in D.C. Final Analysis: If this is how it ends, bless. This is a beautiful review. I've been an X-Files fan since the 90s. I've recently been watching reruns and have so enjoyed reading all the reviews and comments on Doux Reviews. Anonymous, thank you for your lovely comment. Finally saw this one and I'll admit I tried not to look at most of the guts part of it. (I did get the intended metaphor.) But those last few minutes were lovely. There was so little Mulder and Scully and just too much of the villians for the week that apart from the endindg scene that You mention in the review I was really just looking at the clock wishing it would end.